Last update (25 SEP 2013), shows that monday will now be operated. The airline will fly 4 times a week. According to Amadeus (06 MAY 2013), Brussels Airlines cancel its Monday rotation (SN 463) to Kigali, from 06 MAY to 27 MAY. It seems that 2 A330s are currently in check, while a new one is at Zurich for painting. According to Amadeus (01 APR 2013), Brussels Airlines begins its 5th weekly flight today, and not from 01 JUN 2013. The 5th weekly flight will be operated each Monday , from 01 APR 2013 to 13 SEP 2013. Last year, the airline operated this extra flight from JUN to SEP.
Timetables are in the bottom of the page. 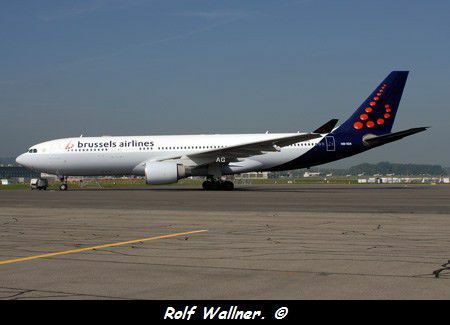 Since the begining of the month, Brussels Airlines sent some of its A330s to the maintanance. It will affect flights to and from Kigali at least until the end of the month. 20h00 : Brussels Airlines Flight SN 1465 Brussels Kigali Entebbe Brussels, left Kigali tonight and will arrive at 5.30 a.m at Brussels. Brussels Airlines Flight SN 465 Brussels Kigali Entebbe Brussels, will arrive at Kigali at 22h00. It will leave Kigali at 23h00. A this time it's too early to know the time of the arrival at Brussels. 01h40 a.m : Brussels Airlines Flight SN 1465 Brussels Kigali Entebbe Brussels, is canceled. Engines problems. Brussels Airlines operates today the flight canceled on 14 MAY. Flight SN 1465 Brussels Kigali Entebbe Brussels is operated with an A330-300. The A330 OO-SFY which operated the flight SN465 on 11 May Brussels Kigali- Entebbe - Brussels turned back to Entebbe, due to an engine problem. The aircraft is grounded at Entebbe. according to eyewithness, they have seen some flames. SN1453 will operate a Brussels Bujumbura Entebbe Brussels today, replacing the SN 453 Brussels Bujumbura Nairobi Brussels, to pick up stranded passengers at Entebbe. SN465 was replaced on 08 May by the SN 1453 Brussels Kigali- Bujumbura - Entebbe - Brussels. According to Amadeus, this routing was only operated today, but one more time, timetables can be changed at the last minute. SN465 operated on 07 May is canceled, passengers have to contact Brussels Airlines before, to know the statuts of the flight. "SN seems to have recurring problems with its L/H fleet. After OO-SFU which flew there last week, OO-SFO is now gone to Malta too; C-check? tech problem? bad planning? They have had to cancel AFI flights almost every day in the last 3-4 weeks. Meanwhile OO-SFU was sitting in ZRH waiting for the paint to dry."